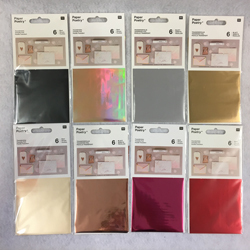 Includes all 8 colours of Rico Transfer Foil, each pack contains 6 sheets 15x9cm. Colours are Gold, Silver, Rose Gold, Champagne, Iridescent, Red, Black and Fuschia, giving a total of 48 sheets. Transfer foils are very easy to use. Apply your design with glue then when it is dry (but still slightly tacky) rub on the foil, which will only attach to the area of your design. Use Rico Glue Pens on paper/card, or Colourcraft Flexiglue on fabrics, paper and other surfaces.